We always hear that it is good to give your students choices. Why then do we very rarely give our students choices in where and how they sit in class each day? So, here is a little class information before I tell you about my foray into flexible seating. Over the last 10 years or so I have had between 27 and 34 students in my class. I went from having a library area, computer center, and 6 tables to waving good-bye to my desktops and adding two more tables. With 8 large tables, 34+ chairs, backpacks, lunch boxes, and jackets, it left little space for much else. I've refused to give up my carpet area and my class library, but pretty much everything else extra had to go. I don't know about you, but I've always been a little bit of a flexible-seater at heart. I expect my students to be at their table and in their chair when I am presenting a lesson, but when it comes time for independent, partner, or group work, students are free to choose where to sit around the room. Recently, I've started seeing blog posts, Instagram pictures, and Pinterest pins portraying teachers' classroom conversions to flexible or alternative seating. I've been intrigued. This year I have a class of 28 full time students. They are amazing kids. Well behaved. Responsible. Respectful. I also have a wonderful new principal who, when I shared this idea with her, told me to go for it. It seemed like the perfect time to give this a try. Before I ever rearranged anything or invested any money, I involved my students. They were the ones this would impact the most and I didn't want to do this unless I had their buy-in. One morning, when they came into class, I had a chart posted on the white board and I asked each student to write his/her name on a sticky note and put the post-it in the column that best described in which situation they do their best work. Once all students had responded, we met in our community circles and I shared my idea with them. They were full of curiosity, excitement, and questions. Together we brainstormed the pros and cons for a flexible seating classroom. Before we continue, there's something you should know about me... I tend to jump feet first into new ideas. One year I ditched my teacher's desk and totally regretted it. Lucky for me, it hadn't gotten taken away when I figured out that I needed it in order to function. 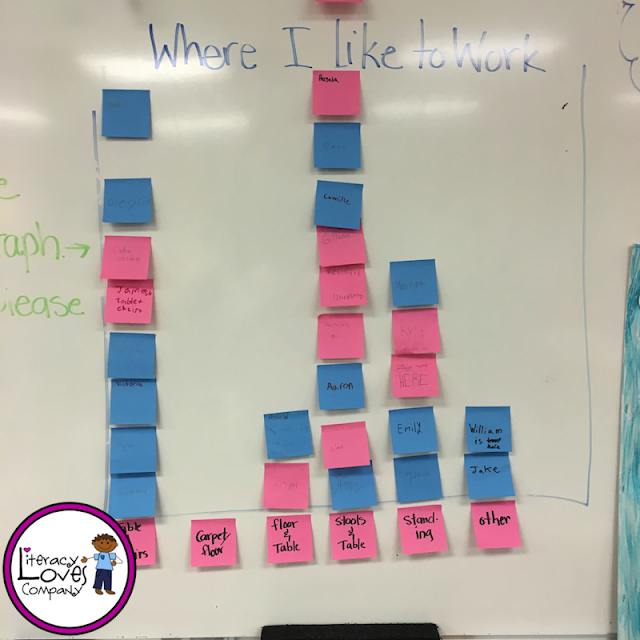 I've also leaped into math centers, interactive read aloud, Genius Hour and much more. 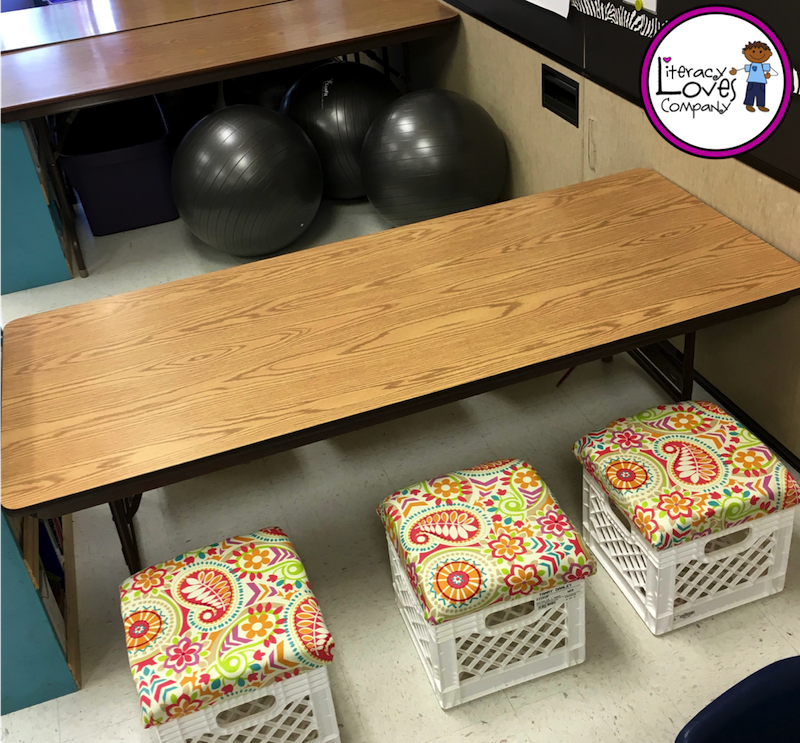 Most of what I dive into I love, but I was not about plunge into full fledged flexible seating without a trial run! On a Monday morning, one week before our spring break, I sat my students down for our weekly class meeting. After our greeting, I asked them if they would like to participate in an experiment with me. Of course, my students were gung-ho to try something different and we set to work re-arranging our class. We raised two tables to standing height. and took the legs off of two tables to make them sit-on-the-floor tables. Another table we lowered to use with the mix-and-match set of stools that my students love to sit on. A few tables with traditional chairs were kept for students who prefer to sit that way. 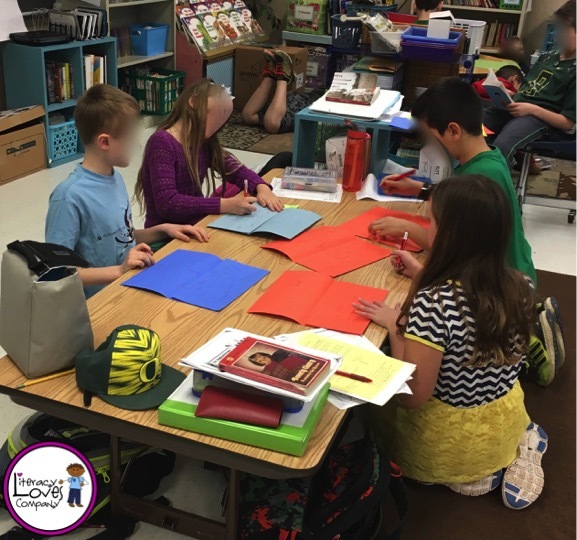 All of these table spaces were located around our meeting rug, which we moved to the center of the classroom. Everyday, at the end of the day, we would debrief on how it was going. 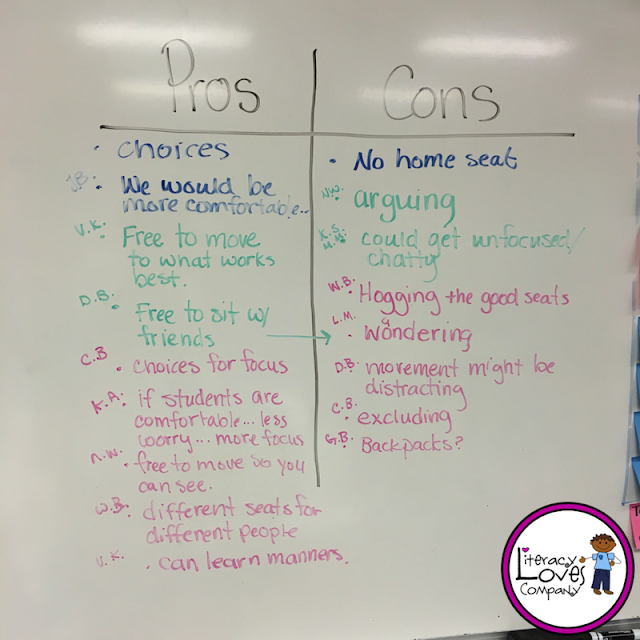 I shared my observations and concerns and they shared theirs. If we had problems, we tried to find solutions. On Friday, before students left for spring break, I had them write a letter to me in their journals. In the letter, they could privately let me know their honest thoughts, concerns, and their vote on whether or not we should keep this seating arrangement once we got back from spring break. 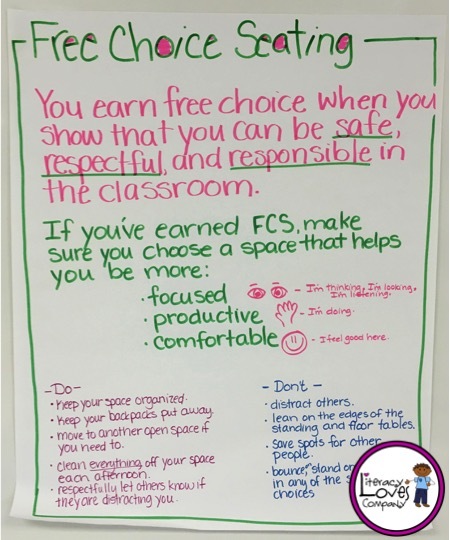 Out of 28 students, 27 voted "yes" to keep the flexible seating. Only one student voted no and it was because she didn't like that students were rushing to get the "good" seats. Many students commented about their increased ability to focus. They liked being able to choose what worked best for them and move if it wasn't working out. 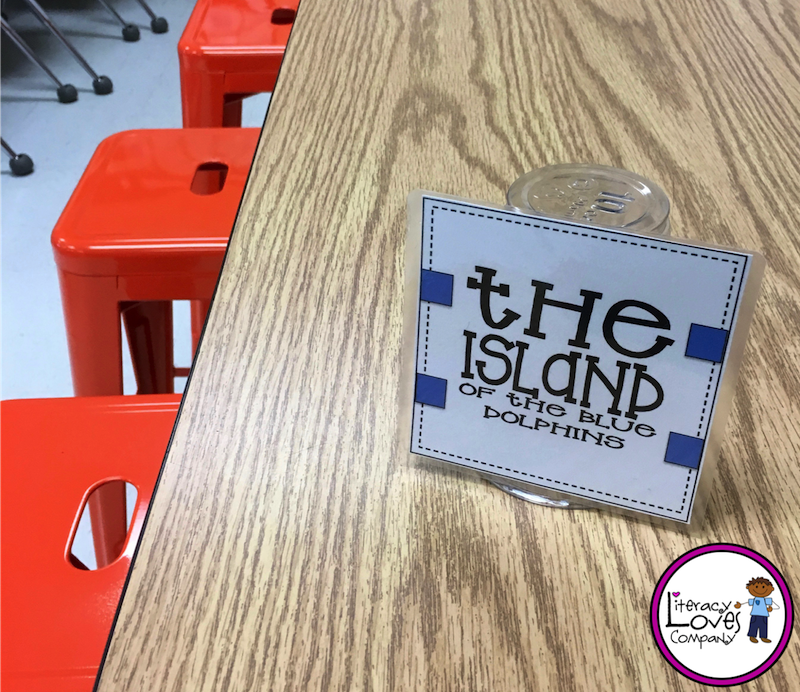 They were pretty insightful in their letters to me and that made me feel even better about the decision to get rid of our chairs and move to a flexible seating model in our classroom. Now, as you may recall, one of the reasons I wanted to try a one week trial was to see if I would be able to handle the affects of students not having assigned seats. Its interesting because it didn't really bother me. My kiddos actually seemed to be more attentive even if they were sitting next to their friends. 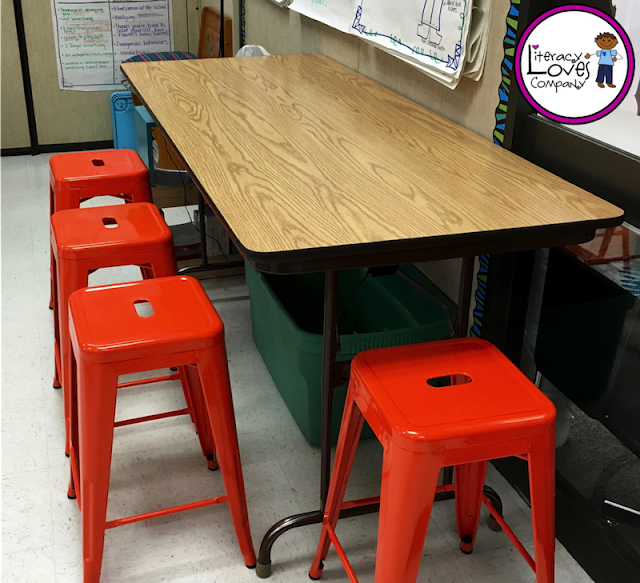 Don't get me wrong... there were times I had to ask a student to make a better choice or remind a kiddo to get back to work, but I didn't miss the chairs at all. Actually, the class looked more open and spacious without all the chairs. Another positive impact of this arrangement is that I found myself moving around the room much more. 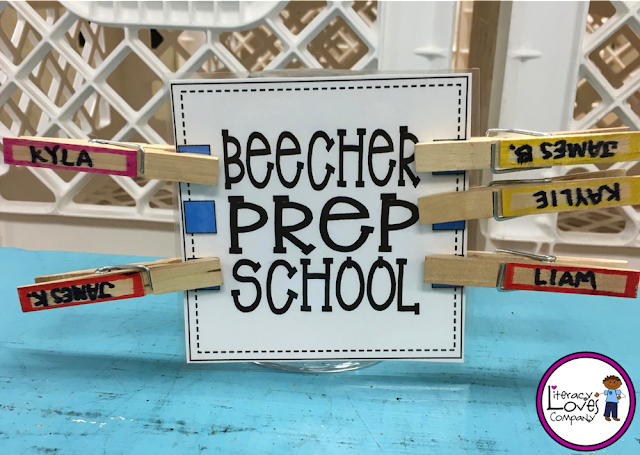 I could teach from the front, the back, and all four corners. 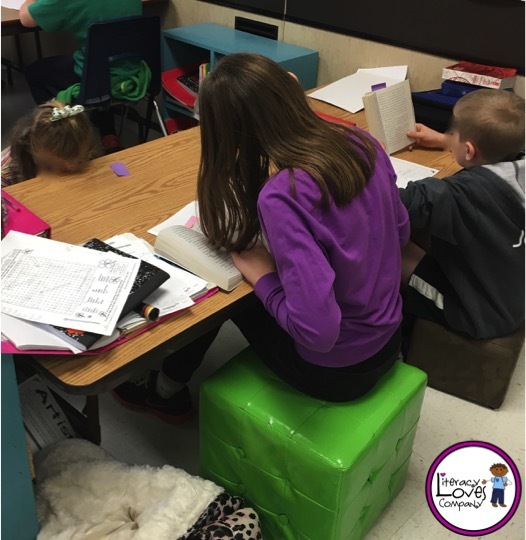 I found myself sitting on the floor, standing with students, and squatting on stools while I worked with my class. The only negative that came from our one week trial is where to put our backpacks. 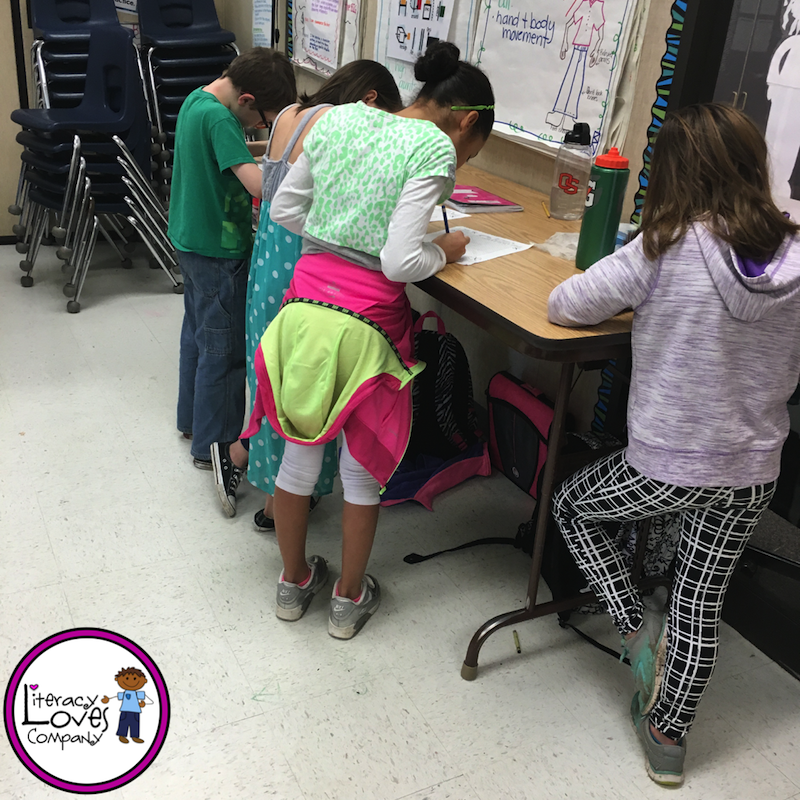 My students have always hung their jackets and backpacks on the backs of their chairs. Now that there aren't any chairs, we have no place to put these items. To solve this problem for the short term, I've brought in two large bins and students put their backpacks in them. We store the bins under the yoga ball table and one of the stool tables during the day. 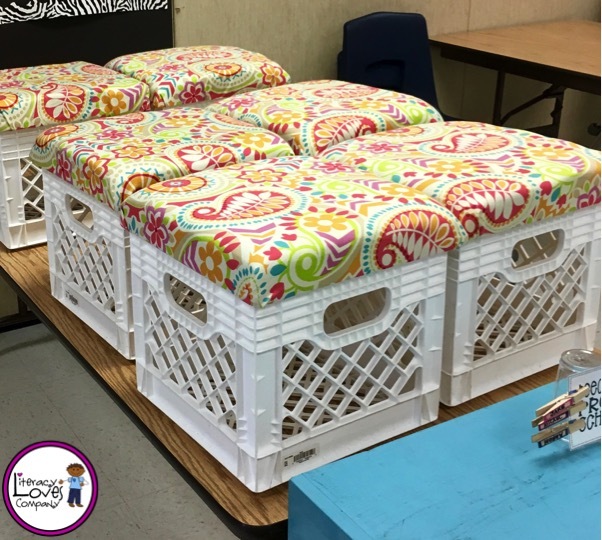 Once it was clear that the new way of seating was going to be beneficial for my students and for myself I started shopping. I was on spring break, so me and Amazon.com got to know each other really well! During our trial period, the stool table was always the one to fill up first. To give more of these types of options, I purchased yoga balls and made crate stools. You can read about the crate seat construction on my last blog post HERE. 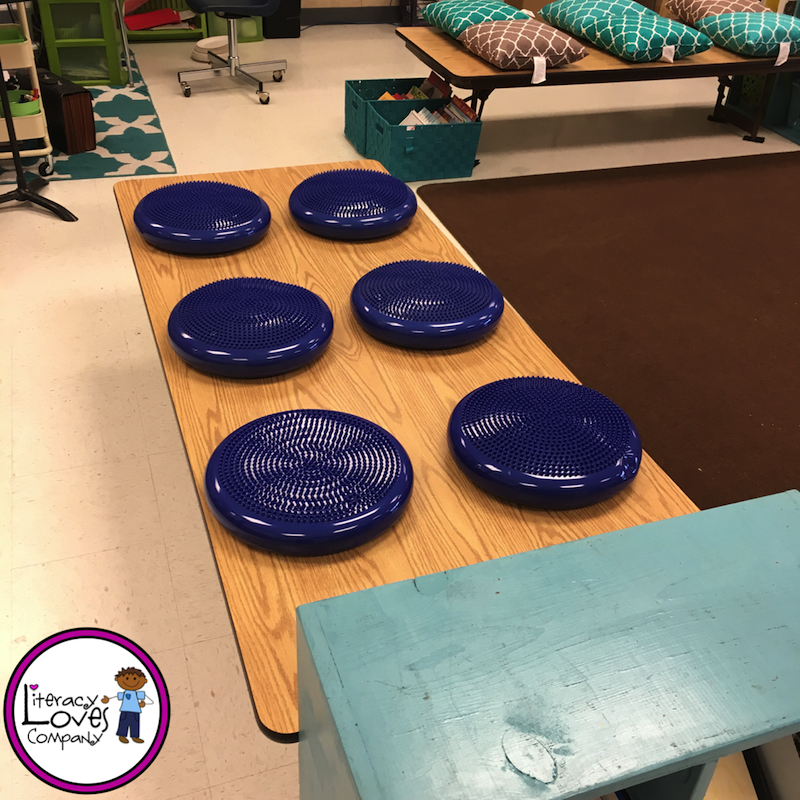 For the floor tables, I purchased "wiggle seats" and floor cushions for students to sit on. For one of the standing tables, I decided to place tall stools instead. I also purchased four bean bag chairs, but I haven't put them in the room yet. I'm still trying to figure out the best space for them. 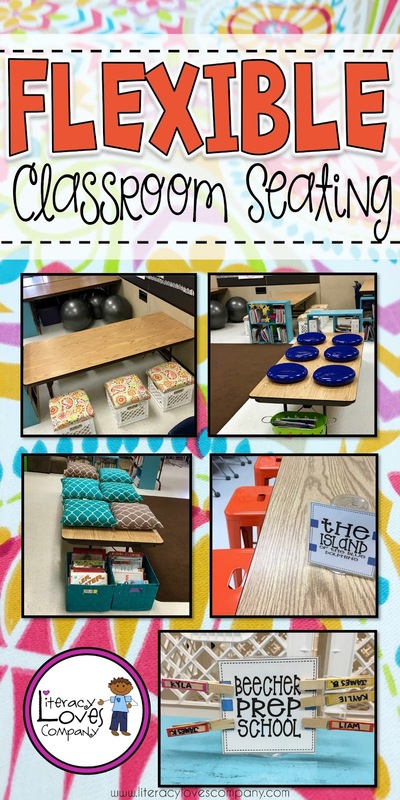 As I am sure you are aware, organization is key to good classroom management. The one week trial brought up several small problems that I needed to work out before we went full bore. The first being very clear expectations and consequences for behavior. This is the anchor chart I made for students to share my expectations and guidelines for their choices. Each of the table areas is named after the setting of a piece of children's literature. Each sign has small squares to indicate how many seat spaces are at that table. 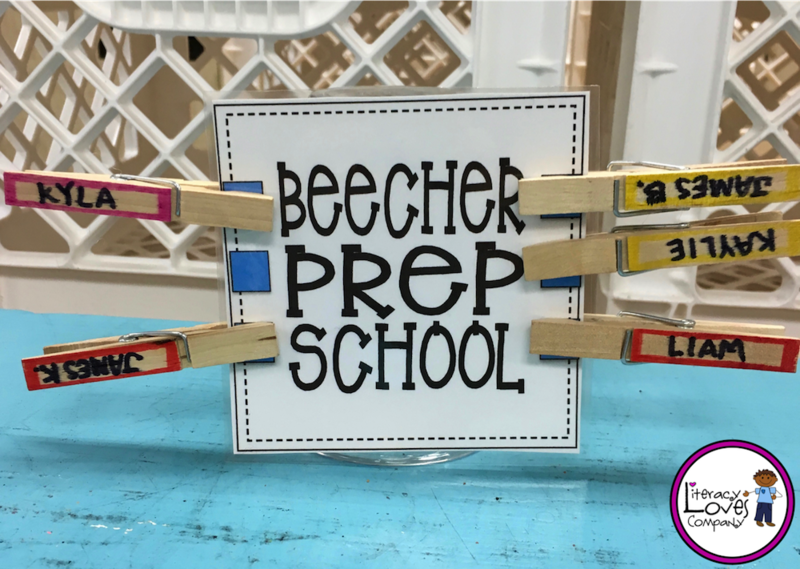 To make sure students aren't arguing over the seating options and everyone gets a chance to choose first, students use clothes pins with their names on them to claim their space. At the end of each day, after students do their clean-up jobs, we meet on the carpet. 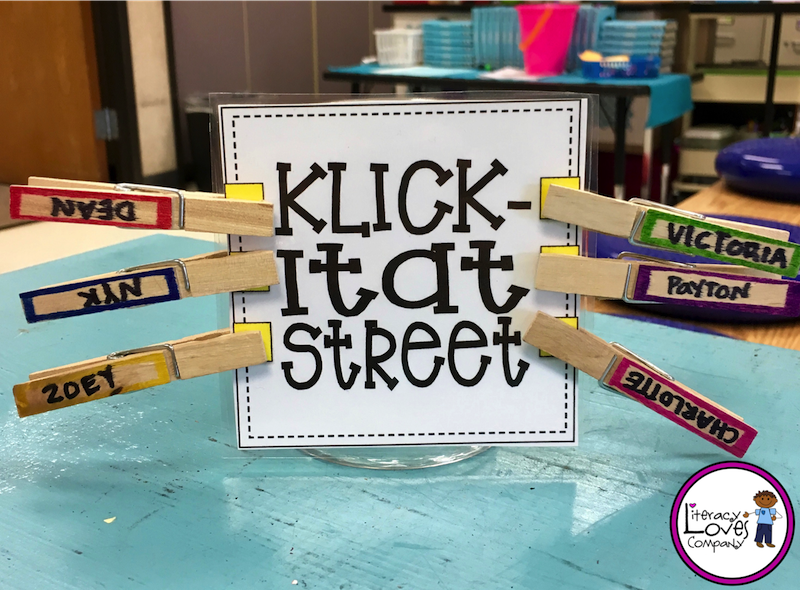 I call each student to line up for dismissal and on their way to the door, they clip their clothes pin to the sign of their choice. I have a list of names and call a different student to go first each day. This gives everyone a chance to try out all of the different seating options. To clean up, we put all of the seats on top of the tables so that our custodian is able to easily sweep and vacuum our room. 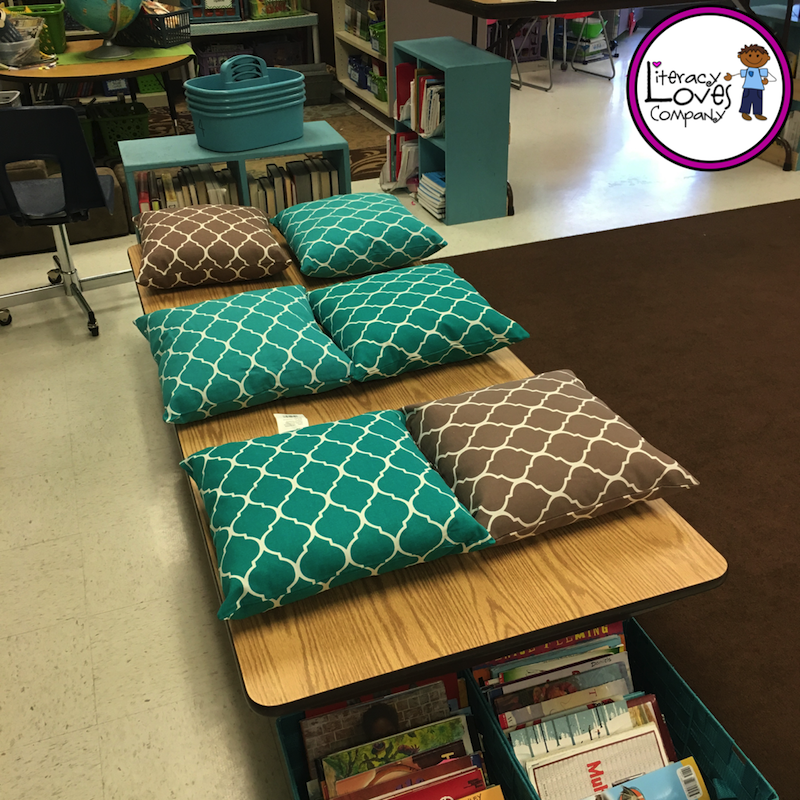 We just completed our first full week of flexible seating and it went well. The seating choices are exciting and fun for the kids, which has caused some off task behavior. 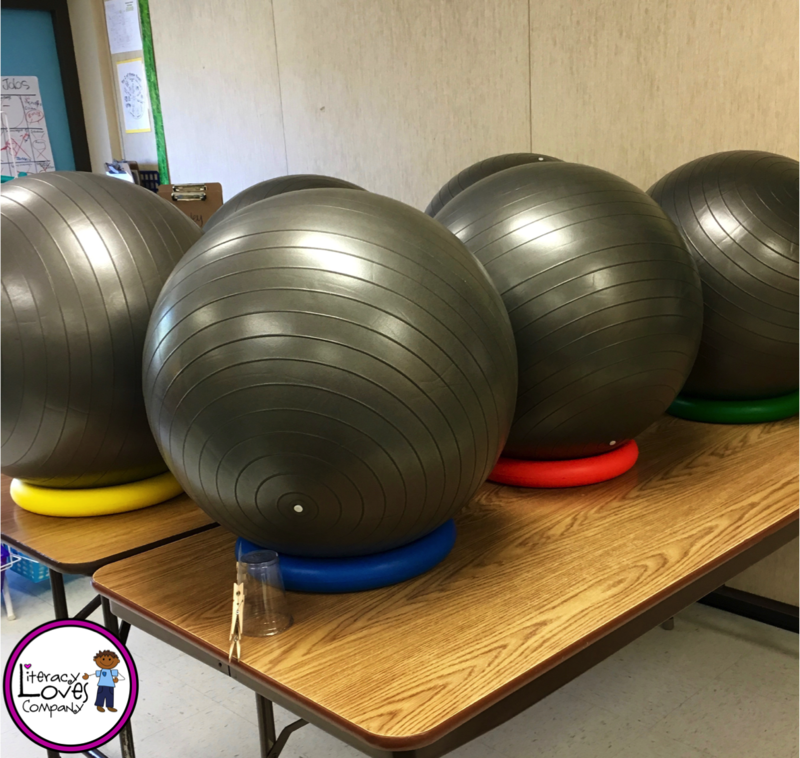 The yoga balls are noisy and students love to bounce them while sitting. These things are driving me a little crazy, but I'm hoping that, once the novelty wears off, the students will be less focused on the seats and more focused on their work. Another drawback is that I've become super paranoid about staples and pencils on the floor out of fear that the yoga balls will pop. All in all, this has been a great experience. There are still some kinks to work out, but I'm loving the challenge of finding solutions and the freedom it has given my students. 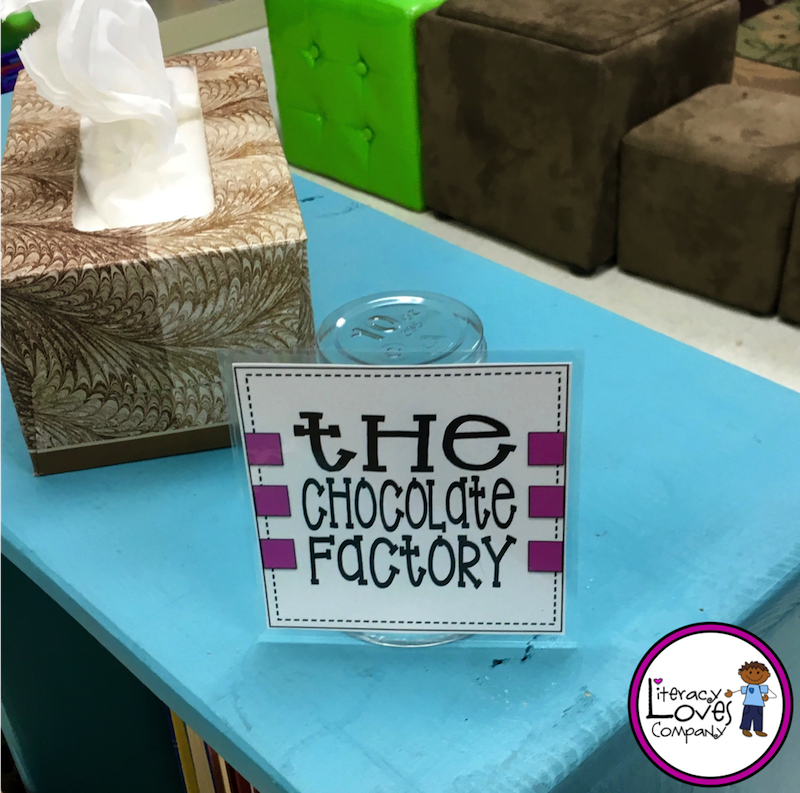 For your free editable download of the table signs click HERE. It is in PowerPoint, so you will need to download and then edit. You will not be able to edit the original. :) The font I used is "HelloBigBen" from Hello Literacy. 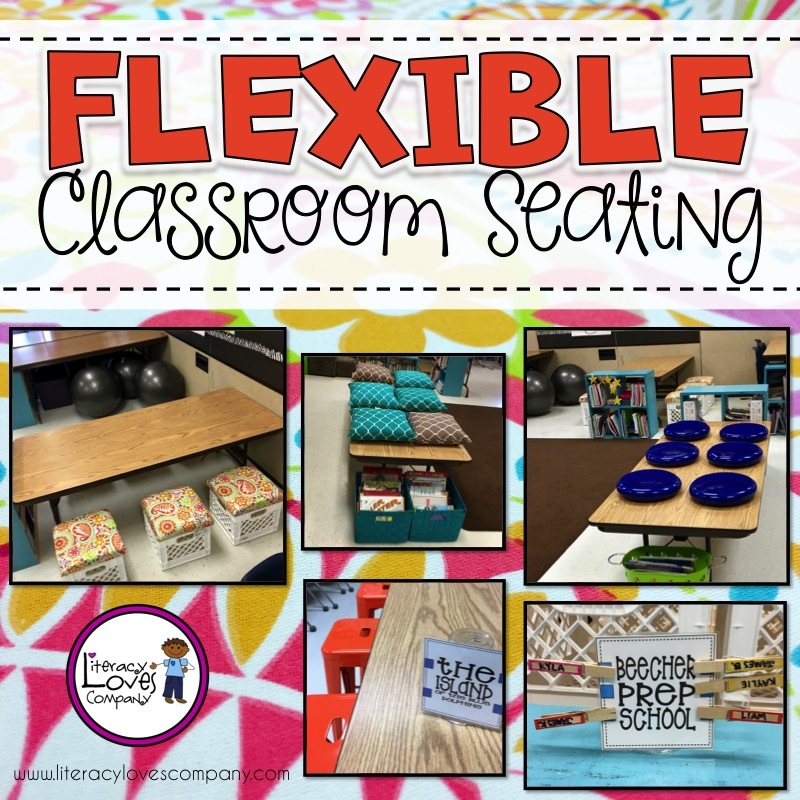 If you have a question about flexible seating or have an experience with it you would like to share, please leave a comment! I'd love to hear from you!